In one of the fastest turnarounds in the history of poker, GentingPoker.com is going all out in an attempt to minimize the damage caused by a strange decision the site made one week ago. 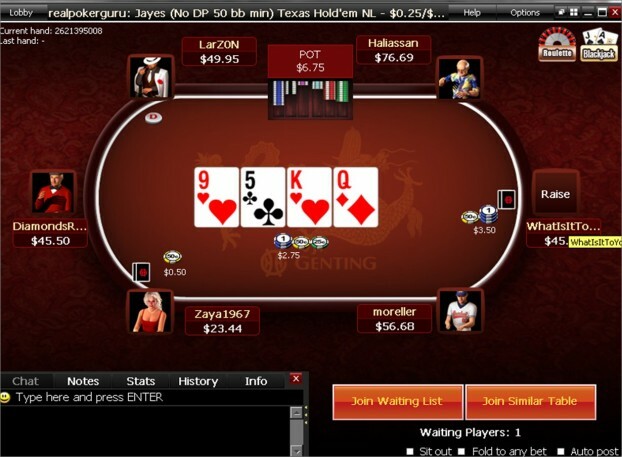 Last Friday, James Lowe, the new Cardroom Manager at Genting Poker’s online poker room (a part of the iPoker network and arm of the massive UK Genting gaming company) posted on thehendonmob.com’s forum that the site had decided to terminate a special promotion between Genting and the Hendon Mob where Hendon Mob players received Tournament $ that they could then use to buy into select live and online tournaments, with a 50/50 profit split –basically the promotion amounted to players being staked by Genting. According to Lowe’s first post (see below), the termination would be effective immediately, and would see all unused tournament dollars voided, leaving some players out hundreds and even thousands of dollars – a later post put the number at just over £14,000. The initial post and a brief follow-up sent the Hendon Mob forum into an uproar, and then complete lack of communication for some three days –even the Hendon Mob owners were unable to get answers from Genting—which led to Genting Poker getting utterly lampooned by the community and the company taking a massive PR hit over what amounts to petty cash for the gaming giant. By Monday Genting backtracked on their earlier decision, deciding to honor the tournament dollars players had already accumulated. Normally the story would end there, but in this instance the story had gained some poker media traction appearing at OnlinePokerReport.com, PokerFuse.com, and across most poker forums. With the poker community now making “Yank sites” comparisons, and qualifiying Genting’s original attempt to confiscate the Tournament Dollars as theft, the company went into full crisis control and has now gone a step further to rectify the situation by not only honoring the Hendon Mob Tournament $, but changing the terms to where the player would receive 100% of the winnings form the event (not the 50% the deal called for) AND by adding low-limit tournaments to the promotion for players with small tournament dollar balances, previously tournament dollars could only be redeemed in events with £100+ buy-ins. It will be interesting to see if this appeases the community, or if the gesture is simply too little too late. The amazing thing is that if Genting had made this final offer first, the poker community would have likely lifted them up on their shoulders and showered them with praise. As it stands, they will be lucky to get out of this with only minimal damage done to the brand. Hi all, my name is James Lowe’ and I have recently taken over as Poker Manager at Genting Poker. Unfortunately my first post is not great news! Genting Poker has decided to stop the Hendon Mob Tournament $ scheme with immediate effect. The VIP scheme available on Genting Poker offers excellent value for all players and all players signed up with Genting Poker will have this scheme available to them. If you have not already used them, the Genting Points can be exchanged for cash or online tournament buy-ins. This does mean that any points you have accrued and not used are no longer valid. Look out for the new Genting VIP scheme currently being planned to go live in July 2013. First Off, I wish to apologies for the confusion my earlier post (and introduction to THM) has caused. This was a genuine mistake on my part. 1. Your Hendon Mob $’s accrued to 14.06.2013 remains redeemable. 2. However, any play on Genting Poker from that date will not accrue Hendon Mob $. You will, however, continue to earn Genting Poker points which are redeemable as per the standard Genting Poker VIP scheme. I will update you shortly with more details on redeeming your HM $. Please can you ensure your email addresses on your Genting Poker accounts are up to date, so we can also email these details. Finally, and again, my sincere apologies for the confusion I have caused. I hope the above clarifies my initial announcement. For those who are regular visitors to GPS Main Events, I’m sure you’ll find me at a future one! Sorry about the delay, I was ensuring that you got the most of the Sponsorship $ you possibly could. You will now keep 100% of winnings from any tournament entered through this promotion. As I said any points earned up to 14/06/13 will be honoured and added to your balance relating to Hendon Mob Sponsorship $. To find out what that balance is please email support@gentingpoker.com who will confirm your balance. This balance has been verified with The Hendon Mob. Any play after the 14/06/13 will not count towards your Hendon Mob Sponsorship $ balance. Genting have added a number of online tournaments to the list of redeemable tournaments so all those with a balance of £1.10 or more can redeem their points, originally this was $110. If any player with a balance under £1.10 wants to use their Sponsorship $, Genting will convert them into Genting VIP points that can be put towards any approved tournament. All customers who have earned the Hendon Mob Sponsorship $ will receive an email about how to claim their entries, as the redemption will be handled by Genting. You should get this shortly. The terms and conditions and approved tournaments will be updated shortly on this website. I hope this goes someway to restoring your confidence in Genting and myself. I can understand the comments on the forum and offer you my apologies, as I said earlier it was down to a miscommunication. I hope to be at most of the GPS events and look forward to hopefully meeting some of you and having a chat.